Hydraulic systems where water fluid is properly de-aerated and free of contamination are more efficient, produce less noise and have a longer service life. 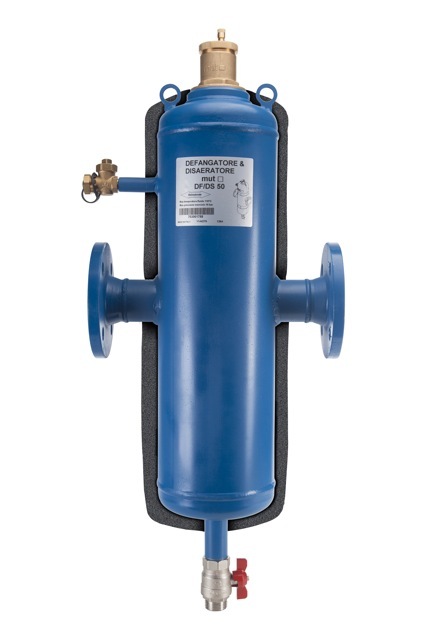 MUT DF/DS air and dirt separators are used to remove continuously air and impurities in the hydraulic circuits. They allow to eliminate all the air present in the circuits in an automatic way and also allow to separate impurities, collecting them in the lower part (collection sump). Inside the “dirt separator”, in a position transverse to the direction of flow, there is a perforated grid (filtrating screen): the particles of impurities bumping the grid undergo a further reduction of speed, and then settle more easily. The periodic twisting-off of the purge valve allows to empty the collection sump. MUT DF/DS de-aerator and dirt separators are supplied complete with hot pre-formed shell insulation to ensure perfect thermal insulation when used with both hot and chilled water.